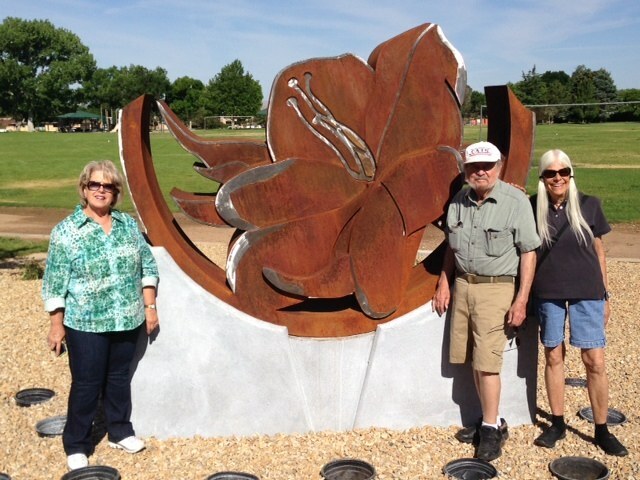 Check out the newest sculpture, "Desert Primrose," in District 8! The newest sculpture in District 8 is entitled “Desert Primrose” representing the “delicate flower that grows throughout New Mexico in very sunny, dry, infertile and rocky soil,” states Albuquerque area artist Karen Yank. Albuquerqueans have probably seen Karen’s sculptures along I-40 at the Coors interchange, or perhaps at Expo New Mexico in front of the Fine Arts Center. Karen’s sculpture was selected as one of nine new sculptures, one for each city council district. “District #8 took a little longer because we had the opportunity to coordinate with the Park renovations,” states Brendan Picker, the Citywide Sculpture project coordinator. For more information about all of the district’s sculpture or throughout Albuquerque, please visit the interactive Public Art map.